Venue: KB316, UTAR Sungai Long Campus, Bandar Sungai Long, Selangor. 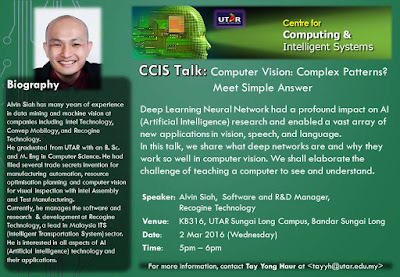 Deep Learning Neural Network had a profound impact on AI (Artificial Intelligence) research and enabled a vast array of new applications in vision, speech, and language. In this talk, we share what deep networks are and why they work so well in computer vision. We shall elaborate the challenge of teaching a computer to see and understand. 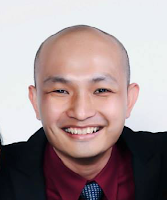 Alvin Siah has many years of experience in data mining and machine vision at companies including Intel Technology, Convep Mobilogy, and Recogine Technology. He graduated from UTAR with an B. Sc. and M. Eng in Computer Science. He had filed several trade secrets invention for manufacturing automation, resource optimisation planning and computer vision for visual inspection with Intel Assembly and Test Manufacturing. Currently, he manages the software and research & development at Recogine Technology, a lead in Malaysia ITS (Intelligent Transportation System) sector. He is interested in all aspects of AI (Artificial Intelligence) technology and their applications.